There’s a plot of sand to suit all tastes on Florida’s Emerald Coast. 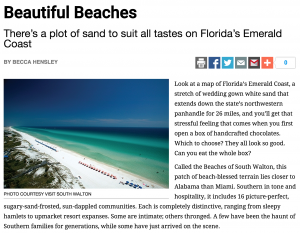 Look at a map of Florida’s Emerald Coast, a stretch of wedding gown white sand that extends down the state’s northwestern panhandle for 26 miles, and you’ll get that stressful feeling that comes when you first open a box of handcrafted chocolates. Which to choose? They all look so good. Can you eat the whole box?